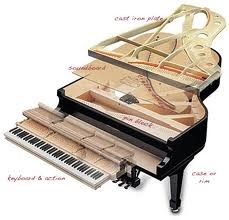 The piano consists of two major “areas”, referred to as the top of the piano and the bottom, or the strings, soundboard, bridging, tuning pins & pinblock vs. the keyboard and damper action of the instrument. 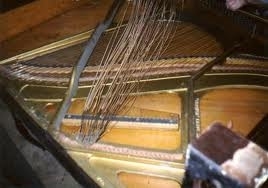 The area of primary interest when referring to rebuilding is the top of the piano. Basically, this is what you see when you look under the lid of a grand piano: i.e., the strings, plate, tuning pins, pinblock (which is not visible), soundboard and bridging, and various felts relative to these parts. Unless addressing action parts replacement, repairs or regulation, or refinishing of the cabinet, this is what is referred to when you speak of rebuilding the instrument. These parts are inter-related and, therefore, thought of as one group. An example of a split bridge. An example of old, damaged pinblock. We only use industry standard, or better, parts in the rebuilding process. Multi-laminate pinblock material of northern hardrock maple is used to manufacture the new pinblock. 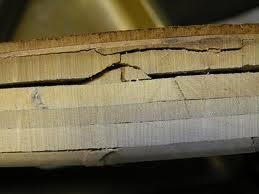 This material meets and usually exceeds that which was used in the original construction of the instrument. Any necessary soundboard and bridging repairs are done and these are refinished. Refinishing, or reguilding the plate is also done prior re-assembly. Nickel plated tuning pins, which both resist rust and look really beautiful, are used along with custom made strings to restring the piano, again usually surpassing the original construction. Bringing an instrument back to its original condition is our specialty. Older pianos were constructed with much finer cabinetry, add the higher quality of many of today’s parts, and this provides for a really superb instrument after it has been rebuilt.